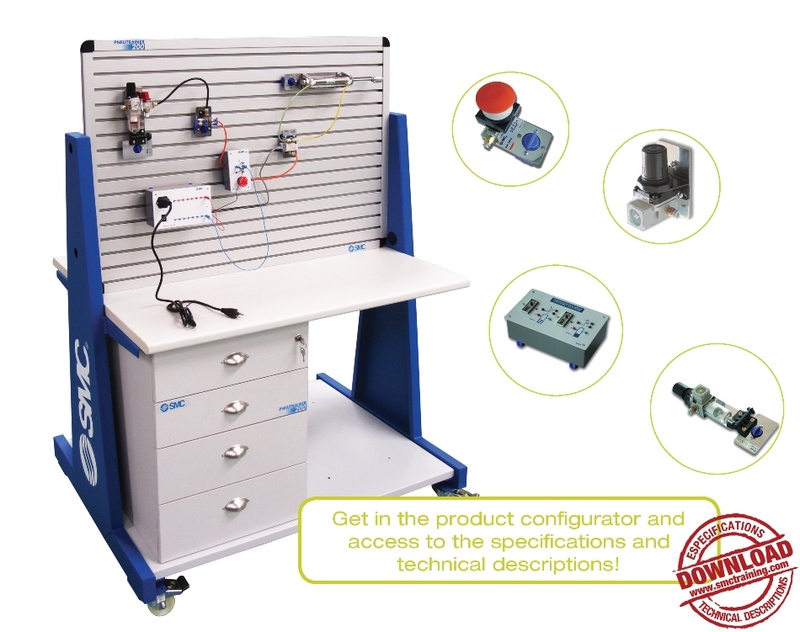 A fully modular and flexible system designed for the development of professional skills related to pneumatics and electro-pneumatics. Its flexibility makes PNEUTRAINER-200 equipment adaptable to all types of user requirements and needs. It also makes a staggered investment over time possible. ASSEMBLY PANELS - Based on an anodized extruded aluminium structure, these assembly panels offer various options. From the basic horizontal panel to the mobile table, we offer solutions adapted to all user requirements.The rolling table includes a panel which enables users to work on both sides at the same time. It also includes a support shelf for component drawers and the pneumatic compressor. All the options provide a perfect basis to carry out a range of practical activities. INDUSTRIAL MATERIALS- All the components used are industrial. Developed and manufactured by SMC and popular throughout the world, they meet the highest quality levels. The components are mounted on a base plate. In order to be identified correctly they have a label with a corresponding reference as well as standardized symbols. CONNECTIONS- The pneumatic components include fittings for quick connection for 4 mm tube. The electro-pneumatics have 2 mm test lead connections. STORAGE- The standard kits include a storage system in EUROBOX containers with thermo-moulded trays which allow perfect identification and storage whilst occupying minimum space. These boxes and trays can also be purchased for the storage of customized kits. PNEUTRAINER-200 has 6 standard sets of components defined for training demands at different educational levels. Also, the user can configure personalised kits to meet their needs or to complement a previous purchase. 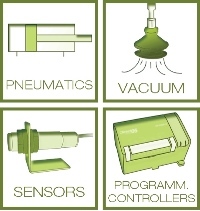 All the available pneumatic and electro-pneumatic components are described below, ordered by category.